In today’s world there seems little option but to adopt the use of social media. Volunteer non-profits such as Dungog District Chamber of Commerce (DDCC) benefit greatly from the opportunity to be able to promote our members and our events together with business and community news and events from the Dungog Shire and further afield. While social media platforms allow for organisations to efficiently engage with their target audience, they also allow users to easily become the targets of reputational attacks, such as unfounded complaints or smear campaigns. Trolls or cyber bullies sometimes labour under the misapprehension that they can say and do what they want online. Examples of trolling include posting repeated comments on message boards or news articles, attacking someone’s character and/or invading their privacy or comments designed to provoke argument. Trolls or cyber bullies sometimes labour under the misapprehension that they can say and do what they want online. Recently the DDCC decided to ban a number of people from posting comment on the DDCC Facebook page. This followed a number of negative, unnecessary and irrelevant comments which fell well below what we believe to be an acceptable community standard. Whilst we do support free speech we do not support trolls and cyber bullies and will not support use of our social media page as a platform for their own agenda. Together with many others, DDCC is a volunteer group of local business people who are passionate about supporting and maintaining local business within our beautiful Shire. If you are uncertain of the work we do or perhaps you feel you would like to make a contribution to work we do, feel free to contact me or a member of our committee, details of which can be found on our website www.ddcc.org.au .We also welcome enthusiastic, thought-provoking individuals to join our committee and of course new members are always welcome for an annual fee of $100.00. Nominations are rolling in for this year’s Business Awards. To nominate head to our website www.ddcc.org.au or pick up a nomination form in many businesses throughout the Shire. This year our 12 categories open for nomination recognize businesses, organizations and individuals who have provided outstanding service throughout the year. The categories also include the popular Hall of Fame award which recognizes people who have made a significant contribution to business over a number of years. Nominations close on 17 April, 2019 with our presentation evening on 18 May at the Clarence Town School of Arts Hall. The award are open to all businesses and organizations in the Dungog Shire. There’s a welcoming new sign for visitors coming in to Dungog from the south. The $20,000 sign in Lioness Park replaces one which was already in disrepair and further damaged in the April 2015 storms forcing council to remove it. Dungog District Chamber of Commerce President Jennifer Lewis said the chamber had been researching funding options to replace the sign since it was first damaged. At this year’s Chamber Business Awards, Parliamentary Secretary for the Hunter Scot MacDonald announced the chamber would receive a $19,662 grant from the Premiers Rural and Regional Fund. 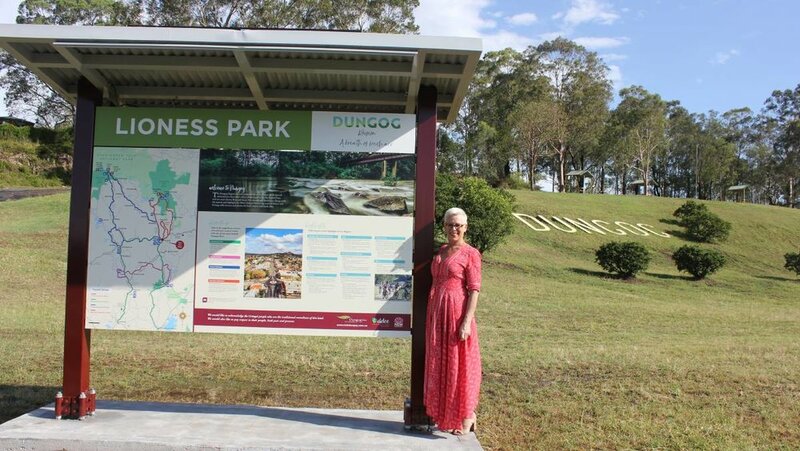 "We wanted the content of the sign to say far more than welcome to Dungog so we set about the challenge of designing a new sign,” said Ms Lewis. The easy-to-read sign shows a current map of the shire which was adapted from the Dungog Drives brochure which shows the horseshoe map. Information and attractions in each village of the shire is detailed and there are photographs by young photographer Aithyn Grove and Ros Runciman. “The content was developed by the chamber committee with the invaluable assistance of Ivan Skaines, Economic Development and Tourism Officer Dungog Shire Council and Dr Cameron Archer, Chair of DRT,” said Ms Lewis. The design is by Danthonia Signs, erected on concrete footings with a cover over head and solar panels to ensure it is illuminated at night. “The sign has been strategically placed with consultation from the Lionesses so as not to obscure the view of the existing iconic Dungog sign and complements the banners which were erected earlier this year,” she said. The grant funding had to be used by the end of this year and with just a few weeks to spare the new sign was erected late last week. “A number of projects have finally come to fruition for the chamber this year including this sign,” said Ms Lewis. “We are very proud of what we have achieved. “We look forward to working with the Community, Council and the Lioness Club of Dungog to developing a master plan to further enhance Lioness Park”. We are pleased to announce that the Chamber in conjunction with Dungog Shire Council will present the Dowling Street Christmas Party on Wednesday, December 5 from 5 pm to 8 pm. Last year’s success, beyond a doubt, was built on community engagement. Businesses, community associations, schools, churches, volunteers and individuals all came together and offered a positive shared family experience. It was so good we just have to do it again and this time, make it even better. We really want to make this a community inclusive event with a focus on promoting local businesses and community organisations, encouraging community support, and of course verychild-friendlyy. Come along and join in the fun. Businesses are being encouraged to extend their trading hours and the event will coincide with the IGA Food and Wine Fair and Combined Churches Carols at the James Theatre. Discover how you can join the 80% of businesses saving with our free energy bill comparison service. Energy costs affect almost every business and household in Australia and we want to help you. Find a better deal with NSW Business Chamber’s FREE energy bill comparison service. Fast, easy and free, this comparison service can either save you money on energy or confirm that you are on the best available rate. What has the comparison and switch service achieved so far? Do yourself a favour and see how much you could save! 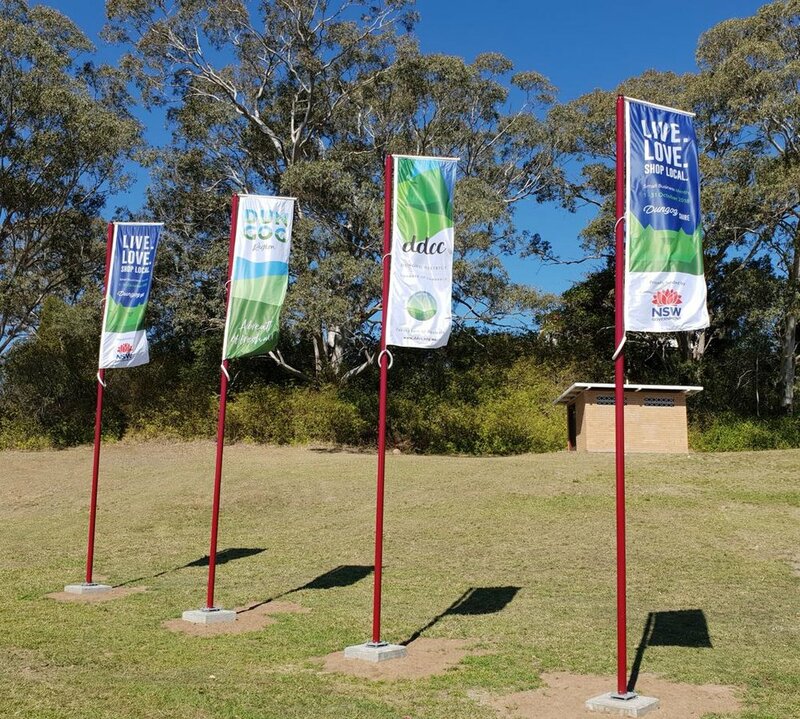 Way back in 2017 Dungog District Chamber of Commerce applied for a grant through the NSW Community Building Partnership to install streetscape banners for our community advertise events and celebrations. Our original grant application was for the banners to be erected in Dowling Street. Unfortunately, only partial funding was received, however not to be beaten we used our funding and relocated our banners to Lioness Park. Finally today our first banners went up. Our thanks to Dungog Shire Council, in particular, Ivan Skaines and Dungog Shire Events for helping with the project. Also many thanks to Col Norman for hanging them.